The TGA convened its breast implant expert working group on 8 April. This followed decisions taken by regulators in France and Canada to remove selected textured implants from their market. The expert working group discussed the current data on breast implant associated anaplastic large cell lymphoma (BIA-ALCL) rates and correlation with type of implant. The group identified gaps in the data currently available to inform an assessment of the true rate of BIA-ALCL in Australia particularly with different grades of texture of the implants. The TGA takes the potential risk to women's health seriously. We have today written to all Australian suppliers of textured breast implants with a formal request for information under section 42 of the Therapeutic Goods Act 1989 . This includes the provision of data on the date when particular implants were first supplied to the Australian market and how many have been supplied so as to develop a clearer understanding of the rates of BIA-ALCL in specific types of implant. Samples of particular products have also been requested by the TGA. Suppliers have 10 working days to responds to the request for information. After receiving information from suppliers TGA will consider whether to suspend or cancel particular products from the Australian Register of Therapeutic Goods. Other regulators, including the US FDA and several European regulators, have also deferred making a decision until more data is available. The expert group confirmed that the breast implant associated cancer is rare. As of 8 April 2019 the TGA has received 76 reports for BIA-ALCL in Australian women, noting that between 13,000-17,000 breast implant procedures are performed in Australia each year. continue to support patients and surgeons to report all adverse events to the TGA. Today, the TGA will also update its website with further information including information on signs and symptoms of BIA-ALCL and a range of questions that women considering a breast implant procedure should ask their surgeon. Women with any concerns about their implants should contact their surgeon. What has the TGA been doing to monitor BIA-ALCL? The TGA has been monitoring BIA-ALCL since 2011 after receiving the first adverse event report in 2009. It established an expert working group in 2016 to seek advice on BIA-ALCL. The working group includes plastic surgeons, cosmetic surgeons, breast-cancer surgeons, cancer epidemiologists, data analysts, public -health practitioners and consumers. The TGA has worked with this group to develop targeted information for consumers and health professionals. The introduction of a new requirement for Patient Information Leaflets for implantable devices commencing in 2018 enhances patient access to information. Why hasn't TGA immediately banned these products? There are a range of types of textured breast implants supplied in Australian. By compelling suppliers to provide additional information specific to the Australian market, the TGA can make well informed decisions about safety of particular types of implants. Suppliers have 10 working days to respond to the request for information. After receiving this information the TGA will consider action to suspend or cancel particular products. The decision by the French regulator appears to be based on events described to them from patients and doctors as well as data published about three implants, which has been extrapolated to other products. Other regulators, including those in the US, Germany and the UK are also seeking additional evidence on the risk of BIA-ALCL, and we are working closely with these regulators. Patients who have breast implants should expect that the regulator makes decisions based on sound scientific and medical evidence. Textured implants of varying roughness are used in 82% of operations in Australia. They play an important role in reconstructive surgery. Smooth implants are an alternative but they may require a higher rate of replacement reoperation due to greater rates of contracture of these implant. The international consensus is that there is no evidence supporting the removal of breast implants in the absence of properly diagnosed BIA-ALCL. Breast implants are fluid-filled pouches inserted in the breast area. People may get breast implants for many reasons, including cosmetic enhancement and reconstruction after surgery. Breast implants differ in their size, shape, filling and texture. Most implants are either round or teardrop-shaped. They may be filled with saline (sterile salt water) or with silicone gel. The surface of the implant may be smooth or textured. Breast implants are not lifetime devices and need to be replaced after 10 to 15 years. If you are considering breast implants, read our page that covers things you should know before undergoing the procedure. What is breast implant associated cancer? Breast implant associated cancer, which is also known as breast implant associated anaplastic large cell lymphoma (BIA-ALCL), is a rare cancer of the immune system. It is not breast cancer, which forms from cells in the breast, but instead a cancer that grows in the fluid and scar tissue that forms around a breast implant. Three years after getting breast implants, Georgia noticed unusual and painful swelling in one of her breasts. Georgia visited her GP who referred her back to the surgeon who inserted the breast implants. The surgeon ordered an ultrasound. The scan identified a build-up of fluid near the implant, and a sample of the fluid was analysed. Georgia was diagnosed with a rare cancer of the immune system, BIA-ALCL. Who can get breast implant associated cancer? All reported cases of breast implant associated cancer in Australia involve patients who have had a textured implant at some point in their life. Based on current evidence, experts do not think breast implant associated cancer is related to either the contents (saline/silicone) or shape (round/teardrop) of the implant. Breast implant associated cancer is rare. Between one in 1000 and one in 10,000 people with breast implants are diagnosed with the condition. Breast implant associated cancer can occur after both cosmetic and reconstruction surgery, with 95% of cases occurring between three and 14 years after the insertion of an implant. In most cases, removal of the implants and the scar tissue that forms around the implant is all that is necessary to treat the cancer. If the cancer has spread to other areas of the body, further treatment is likely to be necessary, such as chemotherapy, radiotherapy or additional surgery. It is important to know the symptoms of breast implant associated cancer. 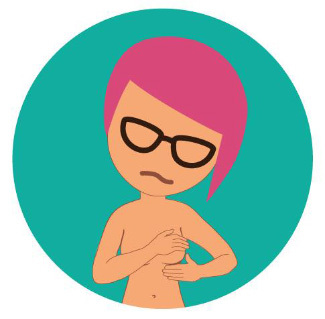 The most common symptom is swelling of a breast caused by fluid build-up, but in some cases it may appear as a lump in the breast or armpit. As this is a rare disease, changes in your breast are unlikely to be breast implant associated cancer. For example, swelling immediately after your breast implant surgery is normal. But you should raise all concerns with your surgeon, including the possibility of breast implant associated cancer. If the surgeon or clinic which performed your original implant operation is no longer available, you should see your GP for referral to another surgeon. Breast implant associated cancer is not detected by a mammogram. If you develop swelling of an implanted breast, your doctor will send you for an ultrasound scan to see if the swelling is due to fluid build-up. If the ultrasound shows that fluid is present, a sample of the fluid will be removed and sent to a laboratory for analysis. This analysis will help identify if the fluid build-up is caused by breast implant associated cancer. Most fluid build-ups are not caused by breast implant associated cancer. What if I have no symptoms at all? Because breast implant associated cancer is rare, experts do not recommend removal of implants in a healthy person with no symptoms. If your surgeon recommends removing implants despite not having any symptoms, we recommend you seek a second opinion. If you do not remember whether your implants are smooth or textured, or what brand they are, your surgeon will be able to advise you on these details. In Australia, breast implants are regulated as high risk medical devices. This means that we evaluate these products for safety, quality and performance (that they will do what they are supposed to) before they can be used in surgery. The TGA also works closely with the Australian Breast Device Registry to monitor the ongoing safety and performance of breast implants. We publish updates on breast implant associated cancer as new information becomes available. Since 2016, we have convened an expert advisory panel to provide consumers and health professionals with advice on breast implant associated cancer. The panel's advice is published on our website. The Agency of Medicine and Health Products Safety (known as ANSM; the French Regulator) held a public forum on 7 and 8 February 2019 to hear submissions relating to breast implants. The minutes from this meeting, along with the information from the FDA public meeting, peer-reviewed publications, and their legislation, are the basis for the decision by the ANSM, published on 4 April 2019, that macro-textured and polyurethane-coated implants would no longer be supplied in France. Health Canada has also announced on 4 April 2019 that Allergan Biocell implants will be suspended from their market. The FDA has acknowledged the latest developments and will publish more information as it becomes available. The TGA strongly encourages you to report all problems associated with medical devices, including breast implants. Your report helps us to monitor the performance and safety of medical devices. We investigate safety concerns, and if there is a problem, we take action to notify and protect the community. Visit the reporting problems page to complete the online form and share any problems you may be experiencing. Please include as much information as you can, including implant/explant dates, model and serial numbers.